In a game like this, 8 out of 10 plays will result in a net positive for Michigan. But sometimes it's those little pesky issues that pop up that can leave a bad taste in your mouth even after a decisive victory. I guess that's the measure of a successful team, or at the very least the measure of an entitled fanbase that even a 37-point victory can be fraught with speculation that things aren't going as well as they should. In the post-game presser Harbaugh noted "...feel like we’re building up a callus with our team. Didn’t come out of this game with any injuries. And we delivered some blows, too. It was a good, real football game.” Which is was. I don't think exiting this game sans injuries isn't a big deal...it is. Michigan needs to stay healthy in some key areas. But at the end of the day, Michigan won by a lot against a not great opponent, which is basically what was supposed to happen anyway. Were there some things that could've gone better? Yes. But is Michigan 2-0 while outscoring both of their vastly overmatched opponents 114 to 17? Yes. Were both games ever in doubt? Never. Let's not read too far into this one, shall we? The passing game. UCF made a point to sell out to stop Michigan's running game, so Drevno and Harbaugh took to the air with expected results. Which was good because they couldn't do much of anything on the ground. But Wilton Speight was locked in through the part of the game when it mattered the most. Parts of the 2nd quarter and much of the 2nd half was really just going through the motions while burning clock...but the 1st quarter, he was masterful getting he football to his talented tight ends and receivers. Special teams. No question the significant edge Michigan had in the first half had a lot to do with special teams. Two blocked punts, two blocked field goals, creating turnovers...all of those things not only keep points off the board for UCF, but flip the field in Michigan favor...which had something to do with Michigan not racking up tons of yards while scoring tons of points. Peppers and Gary. Both of these guys had great games on defense. Both led Michigan in tackles and tackles for loss. Gary notched his first two sacks on his career while Peppers was just all over the field – causing havoc in the backfield, covering receivers, just impressive in whatever he does. Tough guy. He’s been—he got a finger dislocated about the first week of practice and they took him in, put him under the x-ray, and the trainer was like, ‘Man, what is that?’ or something to that effect, and Rashan was like, ‘That’s football.’ Taped it up and went back out. TV coverage. I didn't get to watch the game live, but I did catch the replay afterwards and I just have to admit I really enjoyed ABC's coverage of the game. We complain about crews we don't like so I think it's fair that we commend the good ones. I enjoyed listening to Steve Levy, Brian Griese and Todd McShay. Not only that, but ABC rolls into town with more cameras than their compadres from ESPN and you can feel it during the broadcast. Overall just a solid TV viewing experience. Running game. The running game was NSFW Saturday. Michigan finished with only 119 yards on the ground...and didn't cross the century mark until late in the game. UCF showed up on the defensive line, and also stacking 8 or 9 in the box with safeties only 10 yards deep...which might have taken Michigan's offense by surprise a bit. A lot of teachable moments for Michigan's offense. QB containment. It wasn't so much of an issue while starter Justin Holman was in the game, even though he had some nice scrambles, but UCF backup QB Nick Patti was able to scramble out of the pocket multiple times Saturday. By the time this was happening, the game was well out of reach, so I'm not going to overreact. Early in the game, the defense looked pretty solid all around. The botched punt snap. Too soon, man. Too soon. Weather. The rain held off for most of the game, but the 4th quarter was a wash out. The 7-day forecast for Colorado doesn't look much different. He's dialed in. I'd say he's well beyond where Jake Rudock was at this point last year. He's checking down, he's moving well in the pocket, and his throws are spot on. He's going to be a difference maker as the season goes on. And to think he just barely beat out John O'Korn for the starting spot! Could've given this game ball to number of guys on defense, but Jabrill's ability to be anywhere and everywhere on the field making plays is just too hard to pass up. He's just a special player in more than just his athleticism. He's a great leader for this defense and this team. Blocked two (2!) field goal attempts in this game. This was also a game ball earned in-part by creating general havoc on the defensive side of the ball. Who thought this was coming? I had my concerns about special teams this year when John Baxter left after last season to go to USC...but Saturday was almost a special teams masterpiece (sans the botched punt snap). Two punt blocks, two field goals blocked, and I think the kickoff team or the punt team forced a fumble on a return coverage. If there's any indication that Michigan has returned to form, it's that the crowd didn't seem satisfied with a 37-point win. Against an overmatched opponent that couldn't even reliably get a kick in the air untouched, the coaches had no need to utilize much of the playbook, which led to some ugly plays but won't reveal anything to Colorado, next week's opponent and Michigan's first that appears to have a pulse. 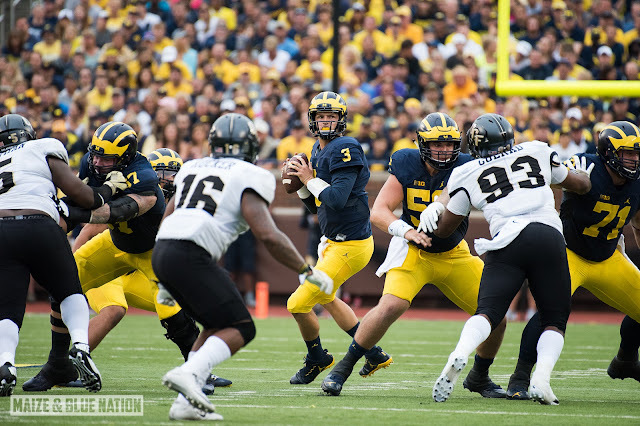 OFFENSIVE CHAMPION – I have watched a lot of Michigan Football over the years – coming up on 40 of them this year – and I have never seen a QB looked more poised, more comfortable and more in command of a Michigan offense in his 2nd career start thanWilton Speight. That includes some great, legendary names down through the years and even when you look at Jake Rudock in Game #2 last year, he was nowhere near the efficiency that Speight is at right now. I get it that Rudock was only on campus for a few weeks this time last year, but let these numbers sink in: since his 1st throw/interception last week, Speight is 35 of 50 for 457 yards with 7 TD’s and 0 INT’s. WoW!!! I’m just gonna leave it at that – WoW!! That UCF intention was thought by the Wolverines to be, and it proved to be, an impossible agenda for UFC. The highly favored Wolverines, fresh off their convincing 63-3 demolition of Hawaii’s Rainbow Warrior’s, had no desire to accommodate such a horrendous scenario. They proved it by thoroughly pummeling the Knights.